Last month, Citi Bike rolled out 200 pedal-assist electric bikes in New York City. As one can imagine, demand is high for these e-bikes, which can reach speeds of 18 miles per hour and will most likely get riders to their destinations faster than the subway. 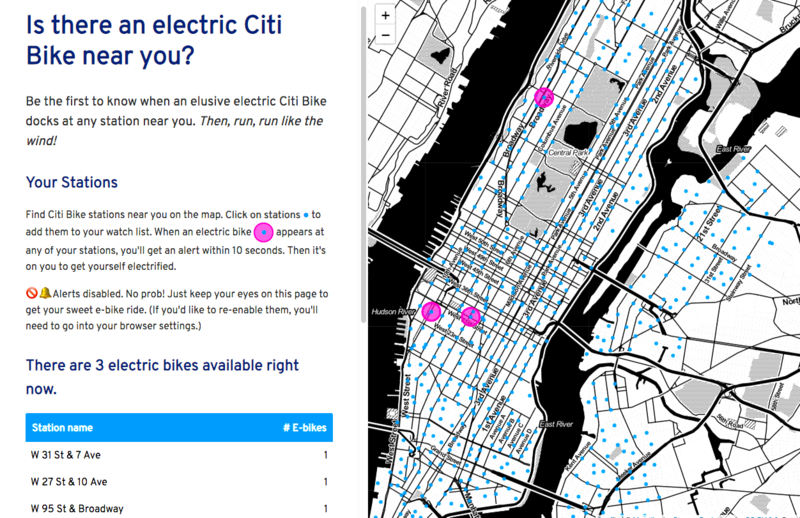 A new map, aptly named “I Want to Ride an Electric Citi Bike,” displays which docking stations have electric bikes at any given time (h/t Maps Mania). Users can find stations near them on the map, add them to a watch list, and be alerted within 10 seconds of its availability. On the map, blue dots indicate Citi Bike stations and pink circles indicate an e-bike has been docked. As the map suggests, once an e-bike docks, “run, run like the wind!” to secure your ride. The creator of the map, Aliza Aufrichtig, used Citi Bike’s real-time data. 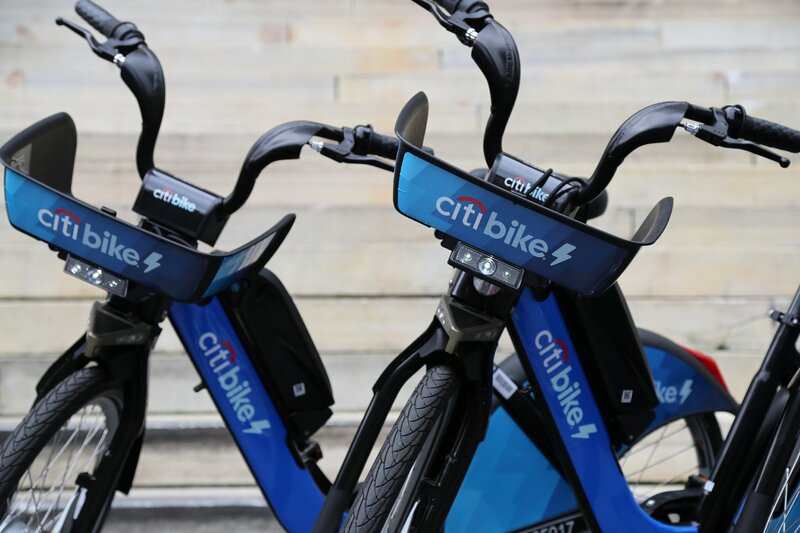 But the map is not affiliated with or sponsored by Citi Bike, which has its own interactive map featured on an app, that includes locations of both classic and e-bikes. The electric Citi Bikes feature a front-wheel pedal assist with an electric “boost,” allowing speeds up to 18 miles per hour. The e-bikes, which do not cost more than the company’s regular bikes, can still be ridden in the bike lanes. And they can be parked at any Citi Bike station across the city. Citi Bike plans on bringing 1,000 e-bikes to the city ahead of the L-train shutdown this spring. Until July, pedal-assist bikes had been illegal. The new law requires the bikes to be labeled with their maximum speed. Locate an e-bike near you with the map found here.